Europe, Asia, and in Africa – to stand up and take action for fairer pay, that anyone who works for a living deserves. 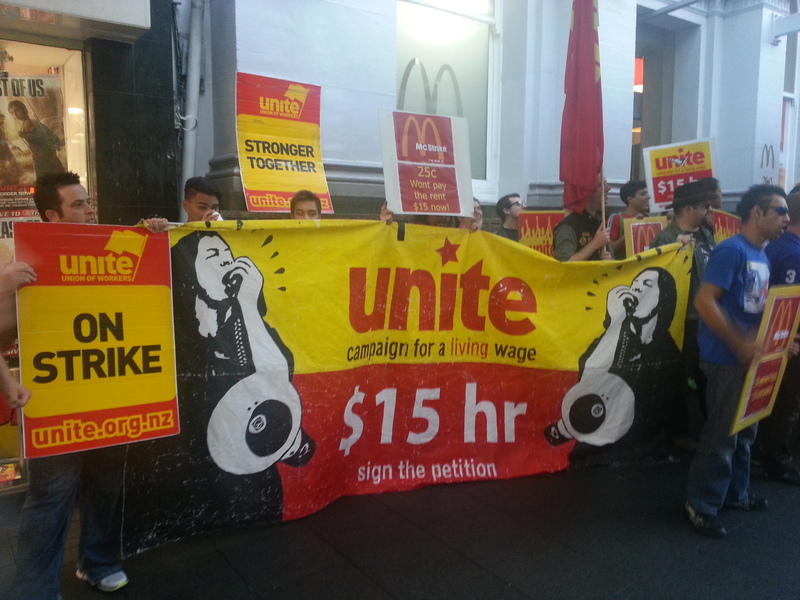 Low wage workers will rally outside McDonalds flagship restaurant in Auckland today (Thursday 15th May) as the first action in a new worldwide campaign for fair pay, and the right for fast food workers to join unions. The campaign, #fastfoodglobal was called by the IUF (International Union of Food, Agricultural, Hotel, Catering, Tobacco and Allied Workers’ Association) after a worldwide conference of fast food workers held in New York last week. 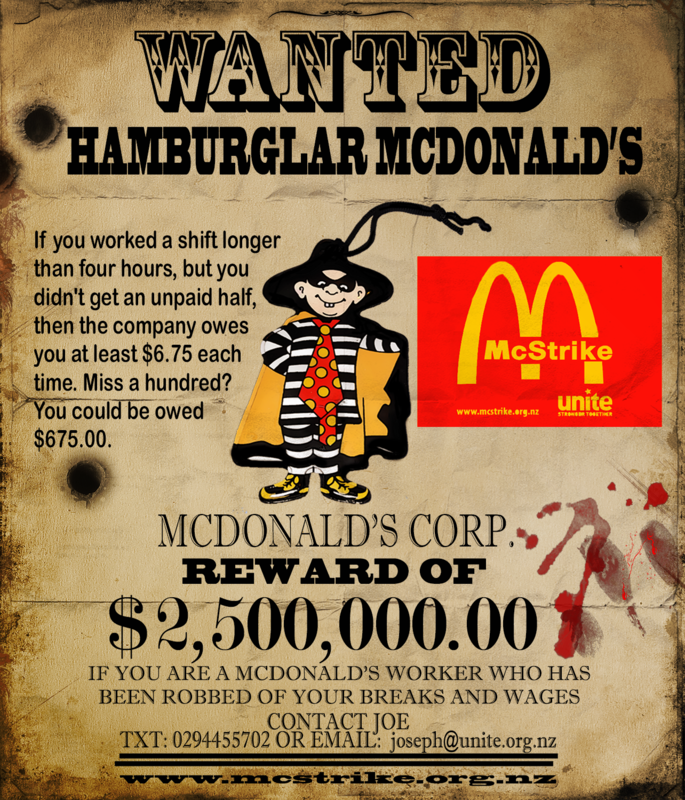 McDonald’s workers around New Zealand are taking action today with the message “Give us a break” because they claim that they are being cheated of their breaks by the company. Unite Union National Director Mike Treen says that workers often miss their breaks or are rostered meal breaks an hour after they start work in violation of the existing law on breaks. “We have filed a case with the Employment Relations Authority over one aspect of this. We have evidence that the company rostered workers for four hour shifts but worked them longer than four hours without providing a meal break. This is a clear breach of the law. In addition they company has breached the worker collective agreement because they also haven’t compensated the workers for he lost break as required by the contract. 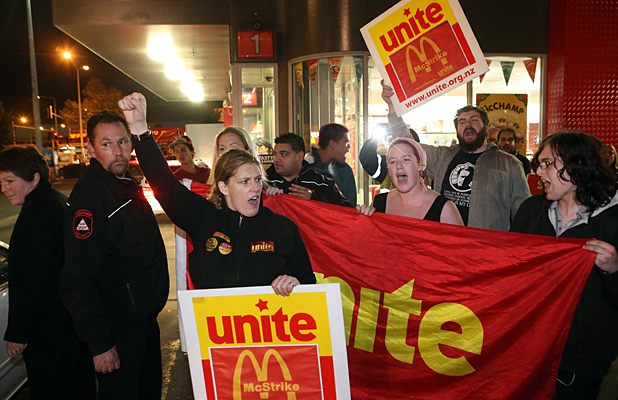 A mediation session between McDonald’s and Unite is scheduled tomorrow on this issue. “We estimate the workers have been cheated of at least $2.5 million dollars. “We have the wage and time records for two stores covering a four month period. The evidence is clear. Now the company is refusing to give us wage and time records for all ours members to hide their misconduct which we believe is another violation of the law. “A worker at McDonald’s will be sacked for putting an extra slice of bacon on a burger. Who in the company is being held accountable for stealing millions of dollars out of the pockets of minimum wage workers? 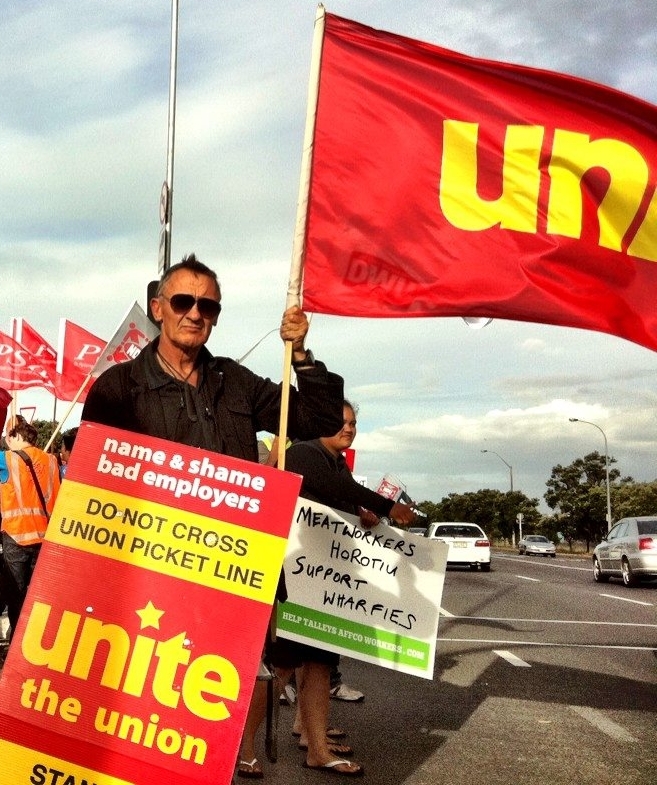 Members and supporters of Unite Union were assaulted last night by security staff at McDonald’s Linwood in Christchurch. A number of people were shoved, thrown to the ground and stomped on. One person has a broken toe as a result. A police paddy wagon arrived as the picket ended. This is the second time in a week that this has happened. Friday last week members and supporters were roughly shoved aside and some pushed to the ground by 20 to 30 police. They cops had arrived with two paddy wagons and without speaking to me or anyone else in charge as to what we were doing wrong, the police formed up in a line to shove a peaceful picket away from the entrance to the Queen St McDonald’s store. It appeared to us that the police were acting as the multinational companies private security. I have been a participant in dozens of union pickets. I have never seen them physically push pickets aside without first explaining what we could legally do or not do. In nearly all cases the parameters of the protest or picket are resolved peacefully. On last Friday’s picket the officer in charge made no attempt to speak to us. When I approached him he was not interested any any dialogue on the issue. The end result was to have 30 cops wasting their time for an hour and a half providing a private security force for the company. Unite Union will be writing to the police and the company to demand that this use of physical force by police and security without good reason be stopped. We have the right to protest under the bill of rights act and we will continue to do so. We will continue to picket stores from one end of New Zealand to the other. We will exercise our rights lawfully and we hope without further interference from the companies private security force – including those wearing a police uniform. High Court Judgement in December 2006 involving the arrest of Rochelle Rees for disorderly conduct for using a megaphone outside a store in an animal rights protest. “The fact that conduct causes annoyance to members of the community, and perhaps serious annoyance, is not enough in itself. Freedom to protest is a fundamental right in any democratic society, (Melser v Police, p 445 per McCarthy J). That right to protest can extend to making a loud and even annoying noise. This freedom was reiterated in the recent Court of Appeal decision R v Brooker  NZAR 68, para ). “It is not correct to say that in exercising the right to protest, a citizen has the duty not to annoy. It is permissible, within limits, for a citizen to annoy others while protesting. It is not enough that the conduct is irritating or ill mannered or in bad taste. Protestors often set out to cause irritation, to attract attention to their message. That is not in itself illegitimate, or a breach of the criminal law. There is a line beyond which protestors cannot cross without offending the criminal law, and that line involves annoyance beyond that which is normal and acceptable to New Zealanders. Loud protests through a megaphone are not uncommon in New Zealand streets. It is a method of protest that is often used. It is not a breach of our criminal law in itself to use such a method of protest. It is not a breach of our criminal law to annoy others while doing so.